Hi Everyone, back with another great set from Joy Clair... this one is called Sunshine Flowers and it took me a couple tries to actually figure out what I wanted to do with it. But once I figured it out, it came together pretty easy. Hope you enjoy!!! 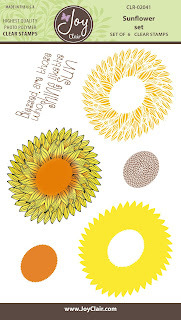 First I used Kromecote paper and the svg file from the shop to cut the sunflowers and centers. I then used Gina K Designs Black Onyx ink to stamp the images with my Stampoholic Nano. The background is Broken China Distress inks on Neenah white cardstock as the base. I had some colored craft sticks to use as the stems, and painted the flowers with Kuretake Gansai Tambi watercolors. A little foam tape and my ATG allowed me to adhere it all together. Be on the watch early April for the next stamp set release, I love the new sets and think you will too.